The term "slab leak" is common and acceptable but not entirely accurate. In most cases, where water appears on a building's slab -- the ground level concrete floor -- the leak is either in plumbing inside or below the slab or the result of water entering from the building's exterior. By the time the water appears on the slab surface, it may have caused considerable damage to the interior of the slab. Whether or not your homeowners insurance covers the damage depends on several factors. Two people taking measures to protect thier home from the aftermath of heavy rainfall. 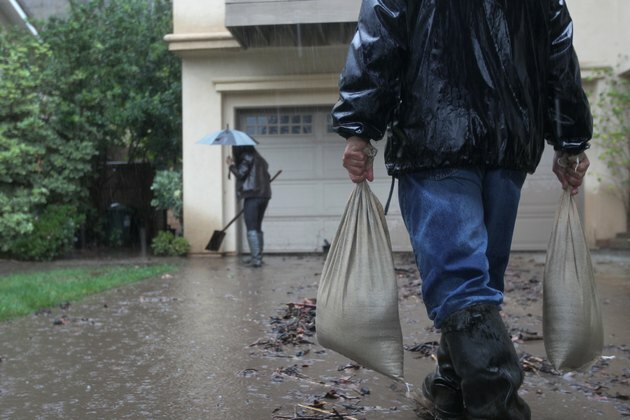 If you live in an area prone to flooding, and water appears on your slab as a result of general area flooding, your flood insurance covers the repair, and you can file a claim on that policy. If you don't have flood insurance, however, your insurance company will likely reject a claim on your homeowners policy for water damage that results from flooding, even if your house is in a low-risk area where flood insurance is not required. If you have plumbing running under or through your building's slab and it bursts, in many cases your homeowners insurance will cover repairs associated with the water damage. It may or may not cover the cost of the plumbing repair. Online legal sites note that your homeowner's insurance does not cover ordinary building upkeep. Your insurance company may consider a leaking pipe as ordinary wear and tear, and even if it pays for the resulting damage may expect you to pay the for the plumbing repair. Even if you are a responsible homeowner who maintains your residence and promptly repairs any of the building's mechanical or plumbing services, pipes may still burst and water damage may occur. If, however, you aren't diligent about keeping your building in good repair, your insurance company may be less sympathetic when you file a claim for water damage. If, for example, you've noticed that water has appeared on the surface of the slab for some time and have just mopped it up until recently, when cracks appeared in that area of the slab, your insurance company may reject your claim entirely. The damage, it may argue, is either entirely or largely the result of your negligence. If you notice a slab leak, file your claim early, even you're not sure that any actual damage has occurred. Your plumber may subsequently discover that a burst pipe has already weakened a section of structural slab, necessitating an expensive repair. If you're not sure where the water is coming from, but it does not appear to be the result of external flooding, note that on your claim -- flood damage is not covered by your homeowners policy. If you've just noticed water on the floor for the first time, note that as well, and state that the problem occurred suddenly -- it's not a gradual leak -- and that the leak appears substantial. You do not have to state the extent of the damage with your initial claim; until the slab is opened, you will likely not know. Note that homeowner coverage in the U.S. is tiered. A relatively inexpensive HO1 policy is less likely to cover water damage than the most expensive HO3 policy. What Does Apartment Insurance Cover in an Earthquake? What is a Zoning Variance and How Do I Obtain One?